I was willing the fog to lift just a bit so I could get my dream shot. Behind me I heard a car door slam. Then the crunch of footsteps behind me, and the low murmur of quiet conversation. The invasion grew. More car doors slammed. Conversations breached the murmur threshold and quickly became downright loud. I might as well have been on the set of a Jerry Springer show. Finally fed up, I stood and headed toward my car, stunned to see it was literally surrounded by garrulous bird watchers. I realized I must’ve looked ridiculous, having taken so much care not to be seen, but surrounded by people who weren’t even trying to hide. But I didn’t. I hate confrontation. The woman who appeared to be the leader of the group, clearly apologetic, assured me they’d all be leaving soon so I could get back to what I was doing. While I was disappointed, I shouldn’t have been surprised. 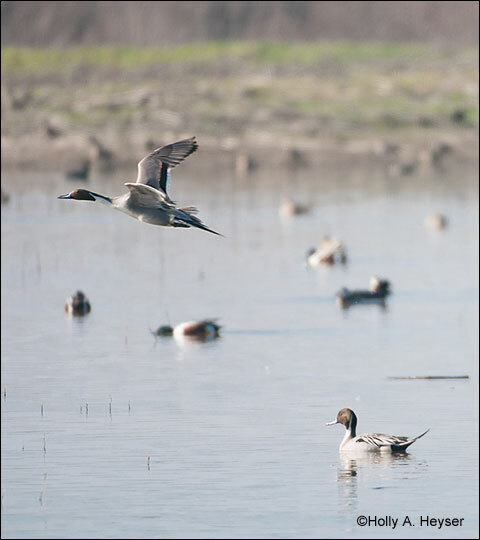 I’d been hunkering down in the bird-watching area at the Yolo Bypass Wildlife Area west of Sacramento, one of the rare places where large numbers of bird watchers and duck hunters routinely come into close contact on public land in California. We’re usually much more segregated. A bull sprig takes off unharmed at the Yolo Bypass Wildlife Area near Sacramento, Calif., in February – one of the better shots author Holly Heyser made that day while hunting with a telephoto lens instead of a shotgun. If you’re not familiar with photography, I can tell you a 200-400mm lens is serious glass – it’d cost you $6,800 new – but even with all that focal power, you still need to get ducks inside 20 yards to fill the frame, which is how you capture all the beautiful detail of their plumage. The ducks in the bird-watching area of Yolo are pretty tolerant – they can tell the difference between people who want to just look at them and people who aim to kill them. But they aren’t park ducks, either – they keep their distance from even bird watchers. I wasn’t going to get my perfect shot without a bigger lens or a quiet blind, and neither was going to happen. That said, my experience that day yielded one insight. Many who oppose hunting tell us we should be content to hunt with cameras – we can get all the thrill of trying to get an animal to come close and let its defenses down, but without the bloody ending. I can confirm that it is, indeed, really cool, and while I don’t have the money to buy that big honkin’ lens, I could see myself getting into wildlife photography bigtime, given the chance. It’s a great opportunity to tickle your hunting instincts during the off season. But not during hunting season. The stalk, or the lure, just isn’t the same without closing the deal. I’m not saying I have to kill an animal every time I go hunting – I’m fine with the lack of guarantees. But the ultimate point of hunting is to feed myself, not pretend I’m trying to feed myself by going through the motions. Sadly, though, we’re more than seven months away from duck season where I live. So for now, going through the motions will have to do.